A series of amplified kinetic objects for record players. Using the phonograph cartridge as a stethoscope to investigate the texture, tone and timbre of the objects placed on the turnatble. Attention is drawn to the difference between the audible acoustic sounds and the amplified timbres, as well as to the random yet rhythmical motion of the objects. 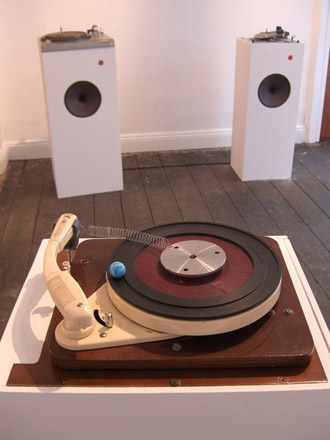 An installation of eight of these works was exhibited in Brighton's Permanent Gallery in August/September 2009, this exhibition was accompanied by a 7" record entitled Two Works for Turntable.